Everyday thousands of people queue to visit the embalmed remains of former leader Ho Chi Minh. The mausoleum in Hanoi was completed in 1975 after two years of construction and six years after Ho Chi Minh’s death. 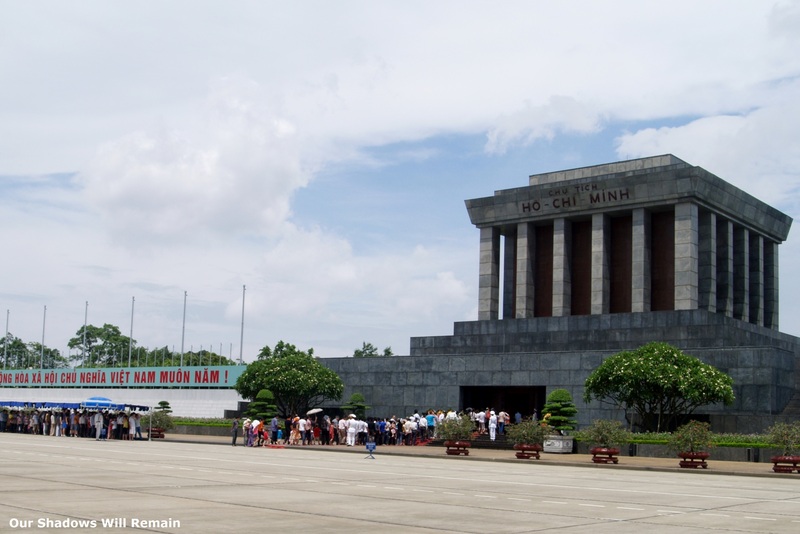 Even though in his will Ho Chi Minh stated that he wanted to be cremated he body was embalmed and displayed in the building which has since been placed in a list of the world’s ugliest buildings. Ho Chi Minh left behind a legacy that didn’t necessarily represent his life. His image is featured on the Vietnamese bank notes, public buildings and many homes, shortly after his death the city of Saigon was changed to Ho Chi Minh City, and any critical opinions and publications of him are banned in Vietnam with Ho Chi Minh frequently being glorified. After following an endless queue for more than a hour I entered the mausoleum. On every corner there was a guard and before I entered the room in which his body was displayed a guard removed hands from pockets, hats from heads and ensure absolute silence. I walked around the outside of the room with the glass coffin in the center of the room, after such a long time queuing I was only in front of the coffin for less than a minute. It was a very surreal experience. You have great photographs on your blog. Is there a particular landmark you wanted to share? Those are very colourful images, I’ll have to visit Singapore one day.